Spray a 12-inch pizza pan with 1/2-inch rim with cooking spray. Crumble the cookie dough on the pan and press evenly down to form a crust. Bake for 12 to 15 minutes or until golden brown. In a medium bowl, beat the cream cheese and sugar with an electric mixer on medium speed until smooth and fluffy. Beat in the sour cream on low speed. 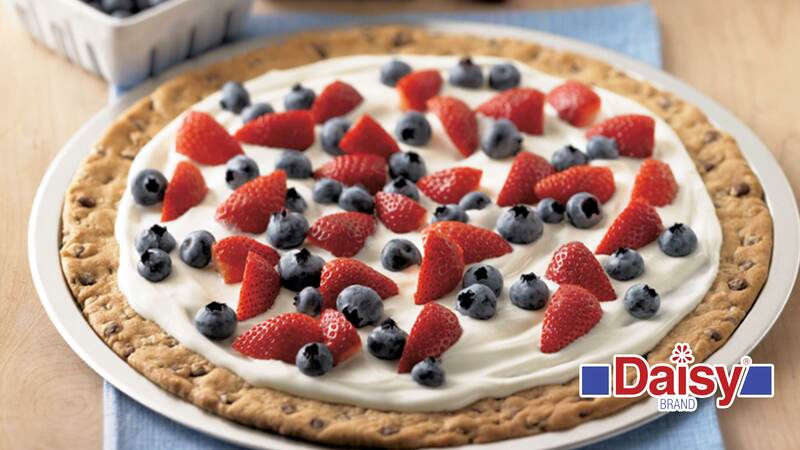 Spread over the cooled cookie crust. Top with strawberries and blueberries in a pretty pattern. Cover; refrigerate for 1 hour before cutting.